In my recent travels, I stumbled on a sign that, well,? just made me laugh out loud. 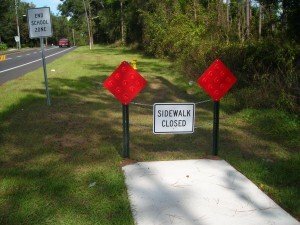 I turned around and had to take a picture of the sidewalk closed sign. Do we really need to be told in such a bold manner that the sidewalk ends? How much money did this Florida development (Heathrow)/Seminole County spend on the sign, posts and chain? I suppose there is some safety or ADA related story that has motivatied this sign expenditure. I hope our York County, Fort Mill, or Tega Cay county and city officials don’t spend our tax dollars like this Florida County. Based on our economic situation and never ending government budget deficits, I think we all could live safety without this sign. What do you think?